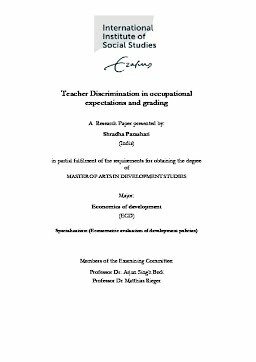 This paper studies the extent of teacher’s discrimination in occupational expecta-tions and analyses whether discrimination in occupational expectations would fur-ther perpetuate discrimination in grading on the basis of student’s caste and socio-economic status. The paper adopts an experimental approach and draws on data generated from 122 teachers from 19 schools in Delhi, India. Student’s caste and socioeconomic status were randomly assigned to a set of essays written by students such that the assigned characteristics were not related to essay quality. The results show that teachers’ expect students belonging to low caste and low socioeconomic status will be less likely to realize their occupational ambitions relative to students belonging to high caste and high socioeconomic status. Consistent with this bias in expectations there is also a bias in grading which shows that low expectations of a teacher perpetuates discrimination in grades awarded. Essays assigned low caste and low socioeconomic status characteristics are graded 3.64 points lower relative to essays assigned to high caste and high socioeconomic status. Given the ultra-competitive nature of schooling in India and the importance of grades in determin-ing access to higher education in India, a 3.64 point disadvantage is substantial. The estimates also show that there is a trade-off between caste and socioeconomic status. Belonging to a high socioeconomic status lowers the extent of discrimination faced by low caste students.